Matt Byrne’s South Australian premiere of the Broadway musical version of Mary Poppins is very high quality amateur theatre. With beautiful orchestration, delightful costumes and quality lead performers, the result is a charming production that will make young audience members swoon with joy at seeing the Disney movie brought to life on the stage. Lauren Potter as Mary Poppins conveyed the tough love of the original Super Nanny with a strong performance and lovely vocals. Brendan Cooney as Bert had an appropriately gruff quality to his voice and managed to imbue his character with cheeky nuance that was rewarded with lots of laughs. Ellonye Keniry as Winifred Banks absolutely shone: her voice was strong and pure, and she skilfully portrayed Winifred’s progression from the downtrodden, silenced and scared wife of Mr Banks to a confident, sharp equal (well, as ‘equal’ as possible in a story that has its roots in the early 1900s). Maggie Wood as Mrs Corry in the Conversation Shop was a hoot! And of course the children (Shalani Wood as Jane Banks and Sebastian Skubala as Michael Banks) were outstanding. Both are young performers with impressive resumes and they exuded confidence and flair as they embodied their roles to perfection. The music is a highlight of a production like this, and the orchestra were flawless in reproducing the much-loved songs. Supercalifragilisticexpialidocious was a high point, as was A Spoonful Of Sugar and Let’s Go Fly A Kite. And of course Chim Chim Cher-ee is an impossibly perfect ear-worm. This is a delightful production and, being excellent value for money, a fabulous opportunity to give young people (and the young at heart!) an experience of live theatre that will leave them humming the tunes for days. Mary Poppins continues at Arts Theatre at various times until Sat 18 Jul and Elizabeth’s Shedley Theatre at various times from Thu 23 Jul until Sat 1 Aug.
Arts Theatre, Thu 2 Jul Matt Byrne’s South Australian premiere of the Broadway musical version of Mary Poppins is very high quality amateur theatre. With beautiful orchestration, delightful costumes and quality lead performers, the result is a charming production that will make young audience members swoon with joy at seeing the Disney movie brought to life on the stage. Lauren Potter as Mary Poppins conveyed the tough love of the original Super Nanny with a strong performance and lovely vocals. Brendan Cooney as Bert had an appropriately gruff quality to his voice and managed to imbue his character with cheeky nuance that was rewarded with lots of laughs. Ellonye Keniry as Winifred Banks absolutely shone: her voice was strong and pure, and she skilfully portrayed Winifred’s progression from the downtrodden, silenced and scared wife of Mr Banks to a confident, sharp equal (well, as ‘equal’ as possible in a story that has its roots in the early 1900s). Maggie Wood as Mrs Corry in the Conversation Shop was a hoot! And of course the children (Shalani Wood as Jane Banks and Sebastian Skubala as Michael Banks) were outstanding. Both are young performers with impressive resumes and they exuded confidence and flair as they embodied their roles to perfection. The music is a highlight of a production like this, and the orchestra were flawless in reproducing the much-loved songs. Supercalifragilisticexpialidocious was a high point, as was A Spoonful Of Sugar and Let’s Go Fly A Kite. And of course Chim Chim Cher-ee is an impossibly perfect ear-worm. This is a delightful production and, being excellent value for money, a fabulous opportunity to give young people (and the young at heart!) an experience of live theatre that will leave them humming the tunes for days. 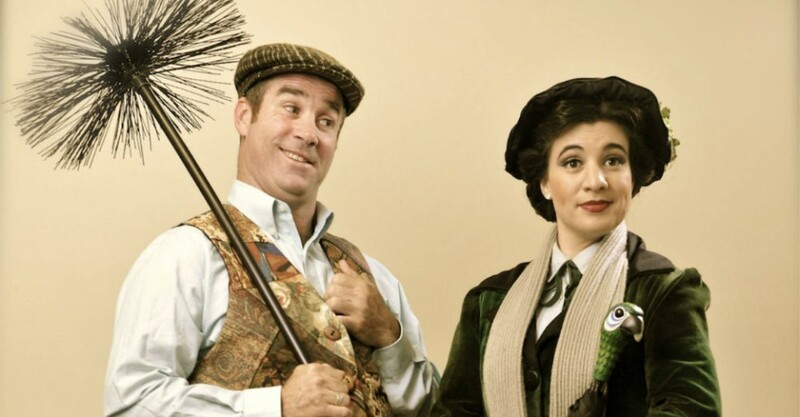 Lynette Washington Mary Poppins continues at Arts Theatre at various times until Sat 18 Jul and Elizabeth’s Shedley Theatre at various times from Thu 23 Jul until Sat 1 Aug. Book at BASS on 131 246 and bass.net.au. Click HERE to purchase your tickets. A delightful production for the whole family that will leave you humming the tunes long after the show is over.